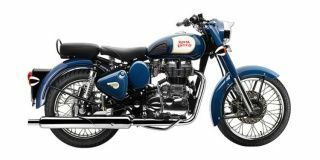 Royal Enfield Classic 350 price in Hyderabad starts from Rs. 1.33 lakh (Ex-showroom). Classic 350 is available in only 6 variant. Royal Enfield Classic 350 Redditch is priced at Rs. 1.46 lakh and the top-end variant Royal Enfield Classic 350 ABS Signals Edition is priced at Rs. 1.61 lakh. Royal Enfield Classic 350's top competitors are Royal Enfield Bullet 350 (price starting at Rs. 1.15 lakh in Hyderabad) and Royal Enfield Thunderbird 350X (price starting at Rs. 1.56 lakh in Hyderabad). Q. I am 5'8" Guy. I am planning to buy Bullet standard 350 (ABS version).Will this model suit me ? what about the maintenance as compare to CL 350? Standard is now single channel abs available in showroom,but for comfort and value for money please wait fill june,you will get electra 350 dual channel abs in much lower price than classic 350 abs. Q. How much will be the service cost if there is no problem in any part? Service cost including the oil and other stuff should be between 1k to 2k and i didn't find problem in finding royal enfield parts. Q. Is it Classic 350 more expensive and complicated than Standard 350 bullet and does the Standard 350 more better for ride and low maintenance than Classic 350? Q. Is it worth then RE 350 CLASSIC? Will we get the spare parts easy in Mumbai?